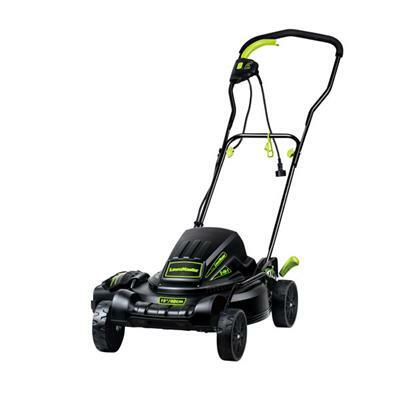 LM Elec Lawn Mower 10Amp 18" LM Elec Lawn Mower 10Amp 18"
18" 2-in-1 Electric Lawn Mower; Mulch or side discharge Powerful 10 Amp Motor 18 In. Cutting Width 2-in-1 Function -Side Discharge & Mulching Capable 6 Cutting Positions with One Touch Height Adjustment Lever This item cannot be shipped to APO/FPO addresses. Please accept our apologies. 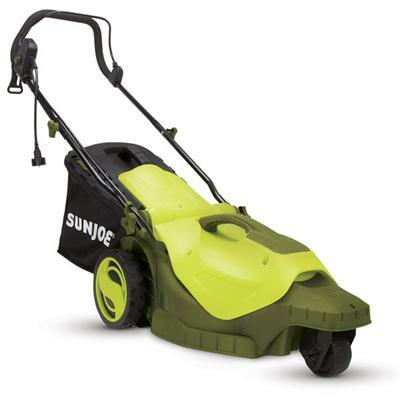 Sun Elec Lawn Mower/Mulcher17" Sun Elec Lawn Mower/Mulcher17"
Sun Joe Mow Joe MJ403E 17" 13 Amp Electric Mower. No more messy gas or oil! Just power up your Mow Joe with the push of a button and watch its powerful 13-amp motor mow a 17-inch wide path in a single pass. Easily Cutting Heigth control with a 7-position height adjustment lever. The 12-gallon rear bag detaches easily for quick disposal or use it as a mulching mower by removing the bag. The MJ403E provides the added security of a safety switch. This item cannot be shipped to APO/FPO addresses. Please accept our apologies. 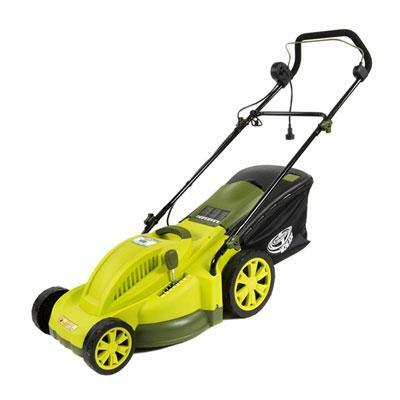 Sun Elec Lawn Mower 3Wheel 16" Sun Elec Lawn Mower 3Wheel 16"
DO MORE WITH LESS THAN 4! Mow with Joe and go with a trio of wheels for the closest cut yet! 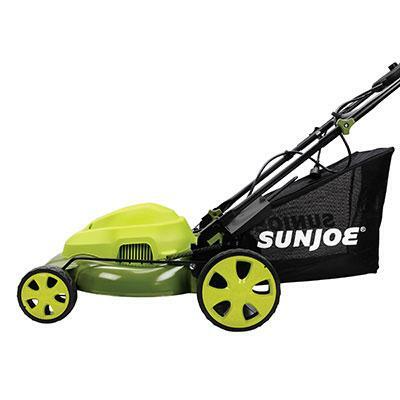 SUN JOE's single nose wheel provides maximum maneuverability the tightest turning ratio and unparalleled precision to easily pivot beneath hedges and up close around trees or flower beds. 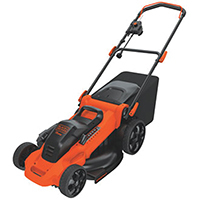 The powerful 12 AMP electric motor ensures care-free continuous cutting and the 16" wide cutting deck 4-position adjustable cutting height plus removable 9.25 gal collection bag allow you tailor your turf with unparalleled precision. Front wheel swivels 360 degrees for tight turns and close cuts around trees flower beds and shrubs. 4-position adjustable cutting height: 1.2 in. - 2.4 in. Grass bag capacity: 9.25 gallons Cutting width: 14.2 in. 0 0. Green This item cannot be shipped to APO/FPO addresses. Please accept our apologies. 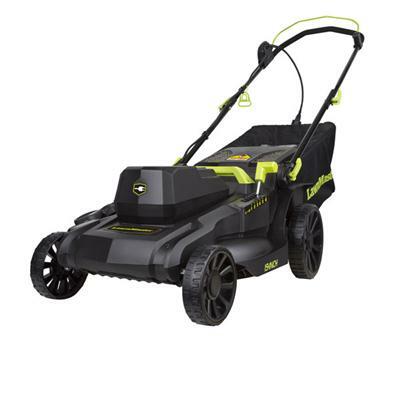 LM Elec Lawn Mower 10Amp 15" LM Elec Lawn Mower 10Amp 15"
15" 10 Amp 2-in-1 Electric Mower; Mulch or side discharge 6 Cutting Positions with One Touch Height Adjustment Lever Simple Start System Never Rust Deck Folding Handle with Cam Locks This item cannot be shipped to APO/FPO addresses. Please accept our apologies. 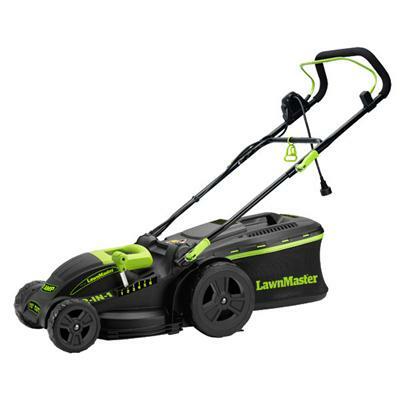 LM Elec Lawn Mower 12.5Amp 18" LM Elec Lawn Mower 12.5Amp 18"
18" 3-in-1 12.5 Amp Electric Lawn Mower; Mulch side discharge; rear bag 19" Deck Width 18" Cutting Width Pass Through Collection Bag for Easy Emptying Simple Start System Stores Upright Never Rust Deck 6 Cutting Positions with One Touch Height Adjustment Lever Folding Handle With Cam Locks Loop style Push Handle This item cannot be shipped to APO/FPO addresses. Please accept our apologies. 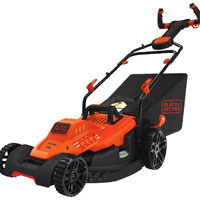 Sun Elec Lawn Mower 12Amp 16" Sun Elec Lawn Mower 12Amp 16"
Sun Joe Electric Lawn Mower 16" 12 AMP. KICK SOME GRASS. Take back your yard with new gear this year and choose the greener grooming solution that's better for you better for your lawn and better for the environment. Say goodbye to gas oil noxious fumes pull-cords and costly tune-ups! For smaller yards the cutting-edge 12-amp electric MJ402E is your greener cleaner alternative to get the job done with zero carbon emissions for cleaner air. Startup is instant reliable and effortless with virtually zero maintenance season after season. Simply plug in your mower and go! 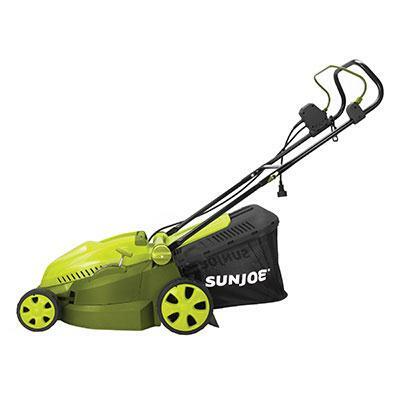 Delivering the power of a gas machine with the convenience of an electric unit it?s durable steel blade cuts a 15-inch wide path with precision on each pass and features a convenient 6-position manual height adjustment for maximum control. MJ402E comes equipped with a detachable 9.3 gallon rear bag for quick and easy disposal. The unit is ETL-approved and carries a full two-year warranty. Maintenance free - No gas oil or tune-u This item cannot be shipped to APO/FPO addresses. Please accept our apologies. 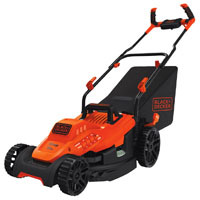 Sun Elec Lawn Mower 12Amp 20" Sun Elec Lawn Mower 12Amp 20"
Sun Joe Electric Lawn Mower 20" 12 AMP. MOW WITH JOE. Take back your yard with new gear this year and choose the greener grooming solution that's better for you better for your lawn and better for the environment. Say goodbye to gas oil noxious fumes pull-cords and costly tune-ups! For small to medium-sized yards the cutting-edge 12-amp electric MJ408E is your greener cleaner alternative to get the job done with zero carbon emissions for cleaner air. Startup is instant reliable and effortless with virtually zero maintenance season after season. Simply plug in your MJ408E and go! 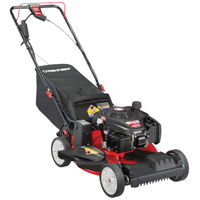 Delivering the power of a gas machine with the convenience of an electric unit it's durable steel blade cuts a 20-inch wide path with precision on each pass and features a convenient 7-position manual height adjustment for maximum control. MJ408E comes equipped with a detachable 14.5 gallon rear collection bag for quick and easy disposal. The unit is ETL-approved and carries a full two-year warranty. Maintenance free This item cannot be shipped to APO/FPO addresses. Please accept our apologies.